All images and local report at Veleiros do Sul vds.com.br. 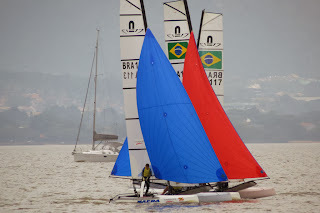 Complicated final for the first South Americans with a squall coming in in the last race. Arg Blando-Bosco were leading when the a +25knot gust came in and forced them to capsized at the upwind mark, giving Freistas-Swan an easy conservative win (look finish above) as the Brasilians watch how the Arg crew went down and change to cruising mode. 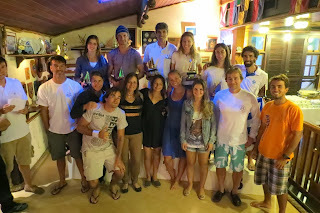 Good initial event for the Class in SA, with the locals gaining experience. They will need it to defend their flag colors at Rio. 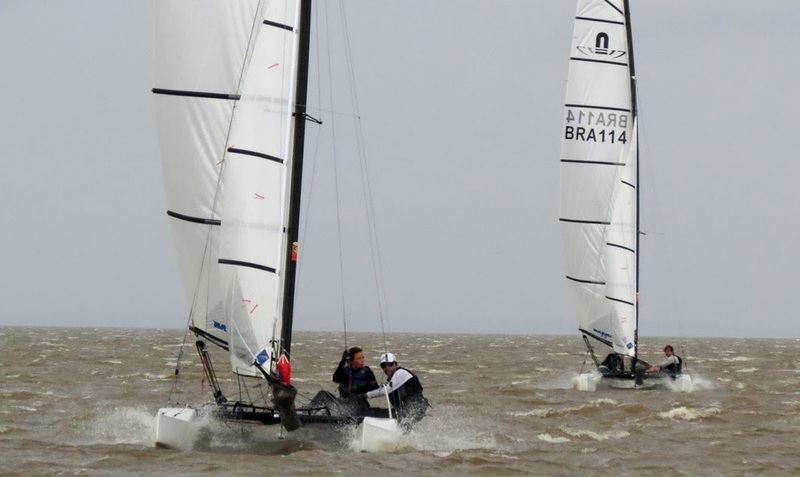 Arg Blando also with a nice debut helming, as they sadly part ways in a cordial manner with Laser Olympic sailor Ceci Carranza past month. Blando & Eugenia Bosco were too close, and as Eugenia was debuting in multis , coming from the 29eres , it is a great achievement for boths against the experienced Brasilian catsailors. So which is finally the best crew combo? Man crewing? 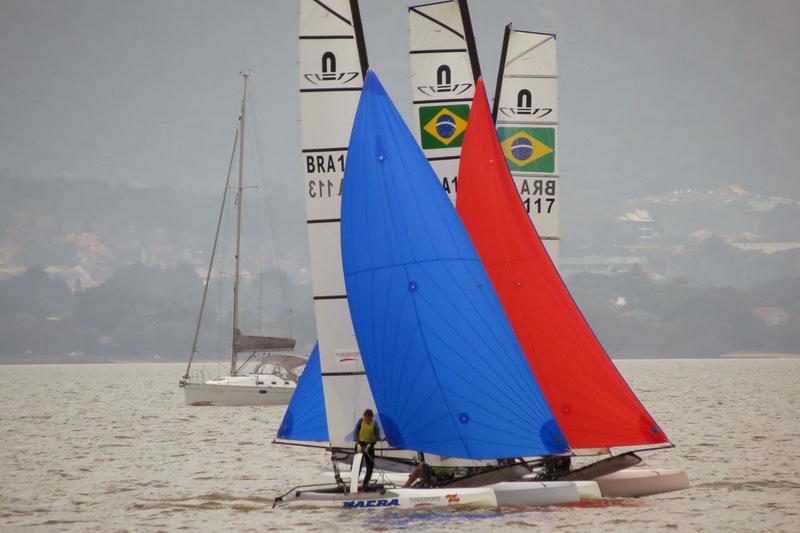 Interesting discussion for the Nacra 17, as in the preview analysis many of us thought that men crew would have an advantage, but the main issue now with that line of thought now is the level of the men helms looking for a spot for Rio: Cammas, Besson, Shuwalow & now Bundy , all long time experienced cat sailors. An experience & catsailing level that is going to be quite hard to match in 3-4 years for the new talented girls coming to helm the two hull world. 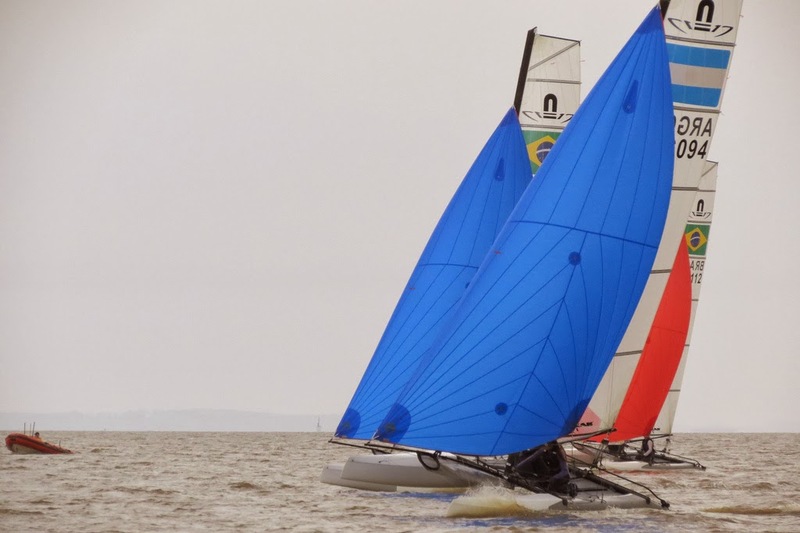 The other factor is that the Nacra 17 allows the helm to manage the mainsheet a la H16, reducing the need of a super fitted strong crew upwind. 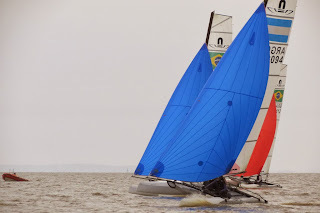 Nevertheless the downwind legs in the breeze on this boat are tougher than the F18 or Tornado. And as pointed out many times , the girls are doing a great job balancing the sometimes jumping platform. At the end the girls are putting the guts to crew one of the most difficult racing beachcats to handle.